so please pay attention to signs and personnel who give warning about the blasting activity. Trailhead dedication of a section of the Mary Draper Ingles Trail located on Appalachian Electric Power property near Winfield, West Virginia. See below for Charleston Gazette article by Rick Steelhammer on the new section of trail and for directions to the trailheads. WINFIELD, W.Va. -- A six-mile segment of the Mary Ingles Trail opened on Wednesday on a series of ridges overlooking the Kanawha River in Putnam County, along the approximate path the trail's namesake took in making her epic, 450-mile escape from Shawnee captivity in 1755. The new trail segment stretches across land owned by American Electric Power, across W.Va. 817 from AEP's John Amos Power Plant. "It's not the easiest trail to walk, or the hardest, either," said Doug Wood, president of the Mary Ingles Trail Blazers Chapter of the West Virginia Scenic Trails Association. "It goes over hills and across creeks and gets you back into the woods. It's probably very like the terrain Mary Draper Ingles traveled through." In 1755, during the French and Indian War, Ingles was a 23-year-old frontier wife living with her extended family at Drapers Meadow, near present-day Blacksburg, Va., when a Shawnee war party attacked the settlement. The pioneer woman's mother was among those killed in the raid, while Ingles, her two sons and a sister-in-law were among the settlers captured. Ingles was separated from her boys and taken to a Shawnee settlement near the site of present-day Portsmouth, Ohio, and then on to Big Bone Lick in north-central Kentucky. There, she and a captive from another settlement known to history as the Old Dutch Woman, managed to escape, and follow the Ohio, Kanawha and New rivers back to Drapers Meadow in a perilous 40-day trek. Her journey "shows the type of grit the settlers had," said Mark Dempsey, vice president for external affairs for AEP, who was among those attending Wednesday's dedication ceremony. 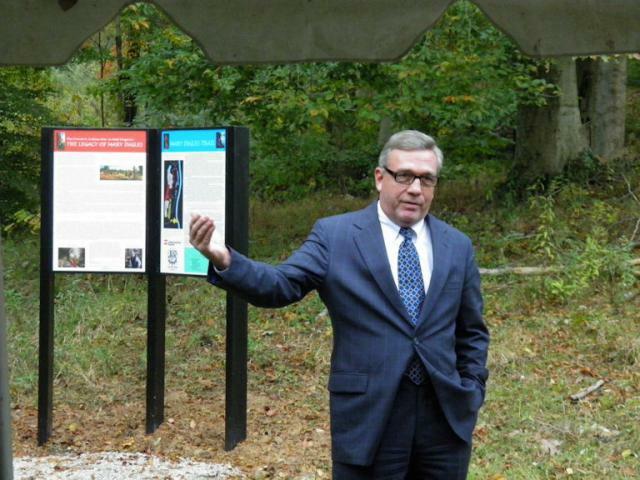 Dempsey said it was his hope that the trail, with interpretive signs telling the basics of the Mary Ingles story at each trailhead, would increase awareness of pioneer life in general, and Draper's journey in particular. 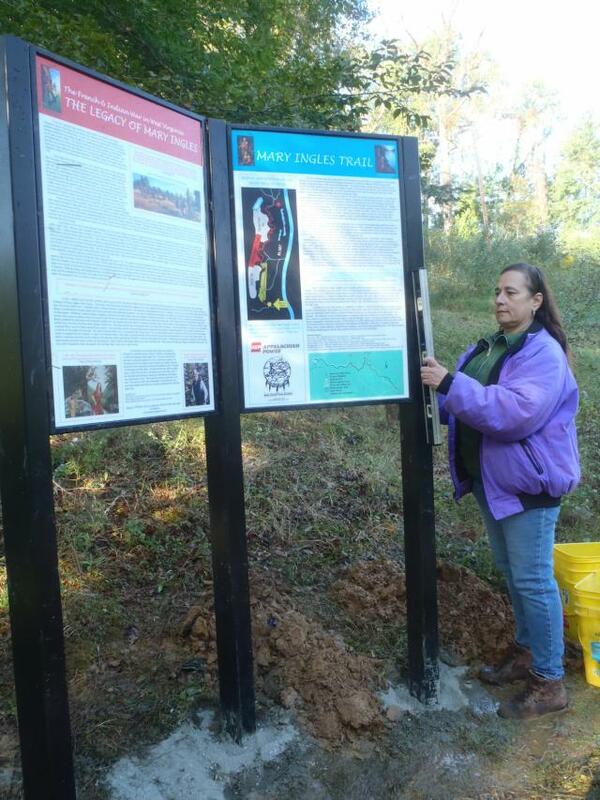 The Mary Ingles Trail Blazers organization is dedicated to memorializing Ingles' courageous journey, and establishing hiking trails along the approximate route followed in 1755. So far, trail segments have been established in Kanawha State Forest, in the New River Gorge National River, and on the AEP conservation tract in Putnam County. AEP personnel built the trailhead facilities for the trail, one near Bills Creek, just off W.Va. 817 a short distance north of the John Amos plant, and the other just south of Winfield near AEP's Wetlands of Winfield nature preserve. At 1 p.m. Nov. 13, Wood and other members of the Mary Ingles Trail Blazers will lead a public through-hike of the new trail, starting from the Wetlands of Winfield Trailhead. The trail covers a variety of terrain types, and offers views of the Kanawha River at several points. 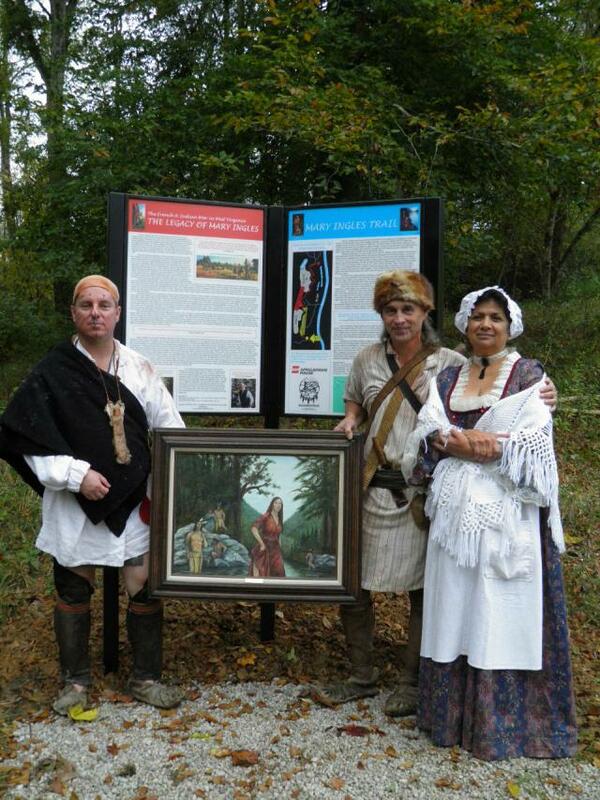 For information on the Mary Ingles Trail, visit http://maryinglestrailblazers.homestead.com. FROM I-64 ST. ALBANS EXIT, at the bottom of the ramp, turn Left to travel W on WV Rt. 817 (old Rt. 35) toward Winfield. Go 3.2 miles from the exit ramp, passing the main entrance to the John E. Amos Power Plant on the Right and Bills Creek Road on the Left to a paved driveway on the Left that turns back off Rt. 817 and heads up an incline to the parking area for the South Trailhead. This trailhead driveway is just a few yards before a driveway on the Left that leads to GEF Fabricators (large GEF sign beside road). To reach the North Trailhead, continue along Rt. 817 for another 3.3 miles (a total of 6.5 miles from the I-64 exit ramp), passing the Twin River log yard on the Left and arriving just a few hundred yards further at the gravel entryway to the trailhead parking area on the Left. There is a very large sign for the town of Winfield just beyond the trailhead entryway (image of General Winfield Scott). The turnoff from Rt. 817 can be tricky with high-speed traffic and a narrow entryway, so be cautious. FROM POINTS WEST OF ST. ALBANS ON I-64, OR ON RTS. 35 OR 817, travel to Winfield to the junction of WV Rt. 34 and WV Rt. 817. Travel east on Rt. 817 through the town of Winfield to Winfield High School on the Left. From the entryway into the High School, travel 1.3 miles to the gravel entryway to the North Trailhead parking area on the Right. If you pass the Twin River log yard, then you have gone too far by a few hundred yards. The turnoff from Rt. 817 can be tricky with high-speed traffic and a narrow entryway, so be cautious. To reach the South Trailhead, continue along Rt. 817 for another 3.3 miles, passing GEF Fabricators to the paved driveway on the Right that heads up an incline to the parking area for the South Trailhead. This trailhead driveway is just a few yards beyond the driveway on the Right that leads to GEF (large GEF sign beside road).